Article written by Sue Richards – a social entrepreneur, artist and cultural animator whose website is www.breastofcanada.com. She is also a member of the Mercury’s Community Editorial Board. Hence my confusion. My understanding of parenting and grand parenting is the desire to leave the offspring with a brighter future, not a nasty, toxic mess of immeasurable size and unmentionable consequences. Fast forward to today. I am in serious need of a new roof on my house. I could make the process very easy on myself and request “brown” then write a cheque. But, given my concern for the future, I can’t do that in good consciousness. Instead, I am compelled to weigh out the triple bottom line of my decision. A triple bottom line includes the single bottom line that dominates most business transactions. Economics. Unfortunately, economics all by itself, does not reflect the full or true cost of doing any business. It never did. You can be sure that the price of trucking used styrofoam cups to St.Thomas and burying them, was never, ever considered when those cups was being made. Back to my roof. Do I go with steel or asphalt? What becomes of the existing shingles? Will they be land filled or recycled? If they are land filled, what are the consequences? 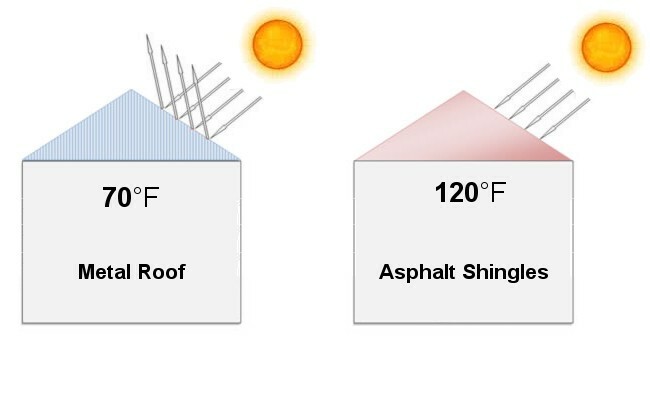 How does the process of producing steel roofing measure against asphalt shingle production? What is the expected lifespan of these products? What can I afford? Much of the advice I have received seems disturbingly short sighted. I¹m asked why I would want to invest in a new roof that will outlive me and told, better to go cheapest. Another words, only look at the single bottom line. Reducing, reusing and recycling is not a fad. It is our reality. Every child that you know is depending on you to use prior knowledge, take correction and stop making more of a mess of this world. Enough is enough. Today is the first day of September. For many of us, this point in the calendar feels more like the new year than the frozen celebration that comes in January. Please use this opportunity to take a loving look at your rosy cheeked darlings. Then, take an honest appraisal at your short sighted habits. Now, make a triple bottom line resolution that will outlive you. The following costs are intended as rough estimates for repairs and improvements to a typical three bedroom home. Heat loss is the term for heat that escapes through the ceiling of the home into the attic, then eventually through the roof deck. Proper air flow or circulation will have a large effect on reducing the amount of heat that escapes through the roof deck. The only way to correct a heat loss issue is through a combination of proper ventilation and proper insulation. In the illustration above, what is happening is that the snow on the roof is creating a “cold zone”. When the heat in the attic escapes through the roof deck it melts the bottom layer of the snow sitting on the roof. When this melt water crosses the exterior wall of the house, it hits another “cold zone” which then causes the water to freeze when it reaches the ice and builds layer upon layers of ice. 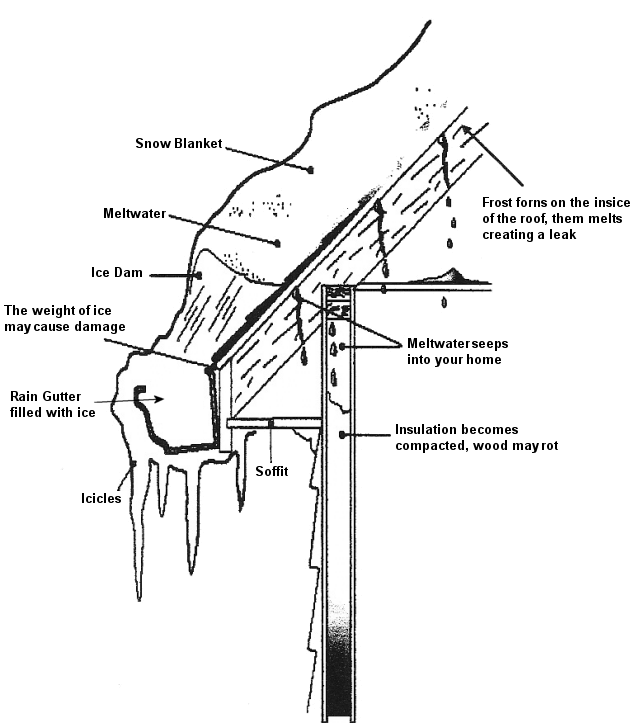 As illustrated, the “ice dam” allows the snow on the roof to build up which now traps the cold on the deck of the roof. Because there is a “cold zone” right on the roof deck, this can cause frost to form inside the roof and as this frost melts it will create a leak inside the house. It is important to realize that the roof is not leaking, but rather frost has formed inside the roof and is now melting the leak. Installing metal roof is definitely the way to avoid the above problem as properly installed metal roofing provides appropriate ventilation. Metal is highly reflective: This involves solar radiation being reflected away from the surface. Metal roof conducts less heat into the attic: Metal roofing, due to the air cavity behind the single and the limited direct contact with the deck, conduct significantly less heat into the attic. Metal Panels: Metal Roofing reflect heat away from the home, keeping the attic cooler. An extended interview with Mike Holmes about roof repair, and contractor warning signs. Originally posted on November 23, 2007 in The Globe and Mail by Mike Holmes. Originally posted in Toronto Sun on Friday, November 26, 2004 – SUN Real Estate section. By Sam McDadi, Remax Performance. View full article on author’s Facebook page. Many Sellers that I encounter want to know which improvements would be worthy of undertaking prior to putting their home on the market. I will share with you studies that reveal the approximate percentage of investment you can expect to get back when you sell your home. Go to our website to learn more about metal roof replacement. That 25-year warranty on your brand new roof may not be as iron-clad as you think, with legal experts and the country’s leading consumer group warning that Canada falls short when it comes to policing product warranties. Caledon, Ont., homeowner Mark Florence has learned the hard way that a long-term roofing guarantee may still leave you seriously out of pocket if something goes wrong after the first five years. His shingle roof, which was just two years old when he bought his property, is now in a bad state of disrepair after just 11 years, far short of the 25-year warranty period. Yet, once the company involved, IKO, had pro-rated the warranty, it told him less than half of the products would be replaced and he would have to pay for the expensive disposal and labour costs. View “Documents“* section on our website to learn about our “Limited 50 Years Warranty Galvanized Pre-Painted Polyester Mat“, “Limited 50 Years Warranty for Aluminum Product” and “Warranty Certificate” sample. *Note that we ask for your e-mail address before you access the documents area. The RE/MAX Return on Reno Index is a proprietary tool to help you get the most value out of every renovating dollar you spend. We took an exhaustive look at the various renovation people commonly do on their homes and judged their return on investment based on a variety of criteria. The findings were nothing short of enlightening. Note return on investment for different house price bracket on the diagrams below and visit our product page to consider new, metal roof for your house or contact us for the estimate.